Well, liberals got their way. 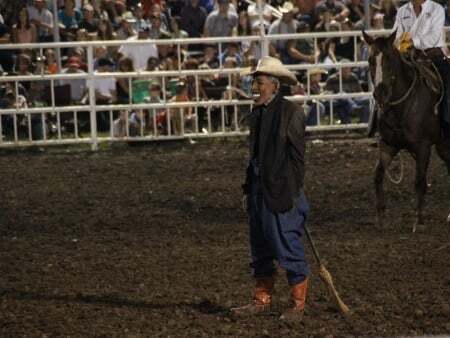 The rodeo clown in question was banned for life from the Missouri rodeo for the horrible crime of making fun of Barack Obama. The Missouri State Fair on Monday imposed a lifetime ban on a rodeo clown whose depiction of President Barack Obama getting charged by a bull was widely criticized by Democratic and Republican officials alike. The rodeo clown won’t be allowed to participate or perform at the fair again. Fair officials say they’re also reviewing whether to take any action against the Missouri Rodeo Cowboy Association, the contractor responsible for Saturday’s event. The entertainment during the bull riding contest featured a clown wearing a mask of Obama with an upside down broomstick attached to his backside. Spectators were asked if they wanted to see “Obama run down by a bull.” Many in the audience responded enthusiastically. Is this North Korea or are we in some sort of weird Twilight Zone episode where the population of the United States was switched with the people in Saddam Hussein’s Iraq? A man just got banned from a rodeo for life because he made fun of the President. He didn’t threaten him. He didn’t wish harm on him. He didn’t say anything racist. He just entertained the crowd by mocking the President of the United States and he had a senator and a governor coming down on him for it in retaliation. Since when did it become such a sin to criticize Dear Leader? Unfortunately for this poor guy, little did he realize how incredibly humorless and thin skinned liberals have become about their failed President.